Pioneers in the industry, we offer water bath heater from India. · Gas Fired Indirect Water Bath Heaters designed in full compliance to API 12K specifications. · Natural Draft Burners, directly mounted on Fire Tube. 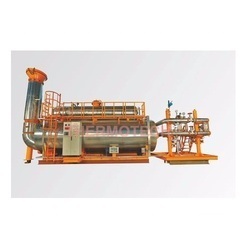 Forced Draft Burners also provided as per requirement. · Precise temperature control of Water Bath. · Equipment adequately designed to allow sufficient retention period. · Removable Single or Twin Fire Tube Design. · Removable Heating Coil for ease of maintenance. · Burners System complete with Pilot, Main Burner, Gas Train, Spark Igniter with Transformer provided. · Flame Arrestors at Burners Air Intake and Stack Top provided. · Large Heating capacity upto 2 Million K.Cal/Hr.